Leptospirosis is a global public health issue that poses the greatest threat in areas with hot and humid climates. The risk of infection is generally higher for low income families who rely on natural water sources for bathing and eating, as well as affluent water sport enthusiasts. The natural reservoirs for leptospirosis are mainly rodents and a variety of domesticated mammals; however it can also be transferred to humans. Human infection is caused by the spirochete bacteria Leptospira interrogans (L. interrogans), and is transmitted via urine and enters the body through mucosa and broken skin. Within the L. interrogans species, over 200 serovars are recognized, which are classified into more than 20 serogroups based on antigenic makeup. During acute infection, leptospires may be detected in blood, urine, or cerebrospinal culture for the first 1-2 weeks following exposure to the pathogen. During the first week after the onset of symptoms, L. interrogans IgM antibodies begin to increase, peak after 2-3 weeks, and then slowly decrease, however they can remain in circulation for several months. The antibody response of IgG is more variable. IgG antibodies normally begin to increase during the second week after the onset of symptoms, and rise steadily until peaking after about 4-5 weeks. The duration during which IgG antibodies are detectable also varies from a short period of time to several years. It is believed that serovar-specific antibodies are immunoprotective against re-infection with the same serovar. Clinical diagnosis of leptospirosis is challenging, as it is frequently unrecognized or confused with viral infections such as dengue, influenza, and Hantavirus. Without proper and timely treatment, leptospirosis can lead to kidney damage, meningitis, liver failure, respiratory distress, and even death. The disease is usually diagnosed in the laboratory by detecting antibodies via: culturing the bacteria from blood, urine or tissues, or by demonstrating the presence of leptospires. Serological methods of diagnosis for leptospirosis are most common and include the microscopic agglutination test (MAT), and antibody detection via techniques such as immunofluorescence, ELISA, and immunochromatographic assays. MAT is considered the standard of serodiagnostics for leptospirosis as it provides serotype-specific information. However this methodology is complex, requires technical experience, and cannot confirm diagnosis until the late acute phase when antibiotic treatment is less effective. 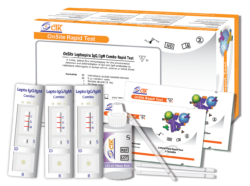 ELISA and rapid tests become popular, as ELISA is suitable for large and well trained setting, and rapid test for setting with small specimen process lab or without skillful technician.